I hate summer. I hate the heat, I hate the humidity, I hate feeling like a human pot roast, being popped into an oven set at four hundred degrees. Starting in the fall, continuing through winter, and into the beginning of spring are enjoyable temperatures for me. Especially winter. I love the cold and snow. I love being outside in winter, I love driving in snow, and I love watching it fall. My theory du jour is that my internal temperature is such that winter brings down my temp to a point that I can relax and just enjoy. But there are certain drawbacks to winter. I miss certain activities that bad weather and extreme cold make a bit more difficult. First on that list is scuba diving. My wife and I are avid and enthusiastic divers. I have been diving for about four years, and Beth about three. We are solidly in our middle-ages (and yes, I plan for my current age to be the mean average for my life span. I’m fifty-four), and for several years I had been searching for an activity that Beth and I could enjoy together currently, and for decades to come. Try as we might, we couldn’t come to an agreement for what that activity might be. The very thoughts of golf just make me want to run screaming, and one or two that we actually tried didn’t take. Until scuba. Our younger daughter decided on a destination wedding on Grand Cayman four years ago. Settling on Cayman as the destination seemed to me to be a torturous path, wandering all over the Pacific, into Central America, touching on the Mediterranean, and finally alighting onto Grand Cayman. Beth and I had not travelled by passport prior to this, and we were in turns excited, nervous, anticipatory, and apprehensive about our first trip to the Caribbean. After arriving in Cayman, we got our rental car, and drove to our condo at Turtle Nest Inn, on the south side of the island near Boddentown. What a fantastic place to stay! Spacious and beautiful, we had a fantastic view of the ocean from the deck, as well as the bedroom. In the end, the wedding was wonderful, our daughter lovely, and the vacation truly amazing. We fell in love with the Caribbean. It was the first vacation that we have been on that I wept as we left. Of course, being a typical guy, I only cry when I’m hungry, and I probably should have had something to eat before our departure. Ahem. But before the trip, I did some thinking. Ever since I was a kid, scuba diving has held a fascination for me. Ever since I saw re-runs of Sea Hunt as a kid, I thought scuba would be an amazing sport. However as time went on, the idea of diving took a back seat to other things, and eventually kind of receded from my thoughts altogether. Until the wedding. When the destination was announced I was in my late forties, and I realized that if I didn’t go diving now I never would. Beth and I sat down and talked it over, weighed our finances, and decided that, yeah, I should give diving a go. I contacted a local diving shop, got prices for lessons and basic equipment, and signed up. Several months before the wedding, I began lessons at Diver’s World in Erie, PA, completing my basic Scuba Diver certification, and much of my Advanced Scuba Diver certification before the trip (click on Diver’s World above to visit their website). What a rush! As is my usual tendency, I punished myself studying, figuring I would flunk out, and beating on myself mentally for ever thinking I was cut out for something like this in the first place. But as is also my usual tendency, I passed with flying colors, got my c-card (that’s “certification card” to you land-lubbing non-divers out there), and completed several additional dives needed for Advanced Certification. When we went to Cayman, I had perhaps a dozen dives total in my logbook, maybe less. I was a newbie, a greenhorn, a rookie, whatever terms one would use to describe someone who is allowed to do an activity, but shouldn’t be trusted alone for more than a nano-second. I contacted a dive shop, Deep Blue Divers Grand Cayman, and arranged for a two tank dive on a given day. I met Rick on the dock at the appropriate time, intimidated and nervous. Rick was great, taking me out by boat to a location that probably couldn’t possibly be much safer. We geared up, did a buddy check, and got in the water. Once we were ready, we dropped below the surface. And I entered paradise. Being new, I blew through an 80 cu. tank of air in about 22 minutes (for comparison, an 80 cu tank now lasts me about an hour), but those few minutes were more wonder producing than anything I had ever done. In Erie, the best visibility I experienced was in the pool, and that was maybe thirty feet. Generally speaking, the viz in the quarries and small lakes that I dived to become certified was ten feet on a good day. In fact, in Lake Pleasant (clearly not named with the underwater visibility in mind), the viz was at best three feet. Up to this point in my diving career, this is all I knew. I had no experience in water in which one could actually see anything. And then I dropped below the surface of the ocean off the south shore of Grand Cayman. Visibility of at least one hundred feet, probably more. The colors, the corals, the fish! Of the multitude of fish I saw, one was particularly delightful! It was small, and colored a deep blue with seemingly neon light blue spots. They weren’t exactly in schools, but there was quite a number of them throughout the dive. Later on I discovered them to be juvenile damselfish, and they remain among my favorites. I am still tickled when I find a few on a dive. Rick took me on an easy, twenty-minute circle in, around, and between corals. I was mesmerized. Honestly, if Rick had just hovered in one spot right under the boat for the entire twenty minutes, I would have been happy. It was unbelievable, and the time was up way too quickly. We did our three minute safety stop, surfaced, and boarded the boat. I had been hooked. I wanted so badly to share my experience with Beth, but how can one describe something like that? It was my first time in the ocean, and I just didn’t have the words to say. So I did what most self-respecting husbands would do. I pestered her to get into scuba herself, so we could dive together. When I got the index finger in the face with the words, “Stop pushing me!!!! !” (emphasis not mine), I knew I needed to back away. That having been said, we did go snorkeling together nearly every day we were there. One time we were snorkeling off Seven Mile Beach, and I would guess we were perhaps a quarter of a mile off shore. I saw a conch on the bottom, and wanted to check it out. I told Beth I would be right back, took a couple deep breaths, and had to power my way to the bottom, probably about twenty feet down. In fact, I had to keep kicking to stay at the bottom. I looked the conch over, and when I was ready to surface, I simply stopped kicking and turned to look at the surface. I popped to the surface with no effort at all. I virtually could not sink! Last year, Beth and I “discovered” Black Bear Cabins in Cook Forest. On our first trip there I was somewhat filled with concern and consternation. When I think of a cabin in the “big woods,” I think of moss on the roof, musty on the inside, perhaps a bit, uh, “unkempt.” Nasty fireplace, bugs, and maybe rodents. I’d rather sleep in a tent. However, what a great surprise! 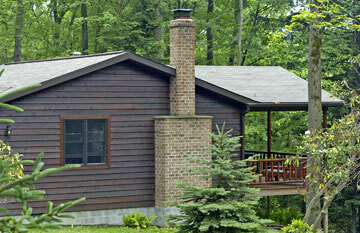 The cabins are clean, heated, small kitchen, and in great condition. Our weekend was really relaxed. Quiet, beautiful setting in the woods, we loved it. We determined to not let that be the last time there. So, through the spring and part of summer, we decided to make another reservation in the fall. We did, and we were really looking forward to the trip. My mother became ill just about the time we were to go, and we had to postpone the trip. The management was kind enough to allow us to just pick another weekend. And that’s this weekend!! Oh, man, the anticipation. No phones, no computer, just Beth and me, reading, relaxing, maybe watching a movie, but mostly just hanging out. We packed a couple of books, some magazines, and a couple games. And of course, I cannot leave my most excellend cigars behind, either. I wouldn’t rule out a walk in the woods, either. Just a bit more about Black Bear Cabins. 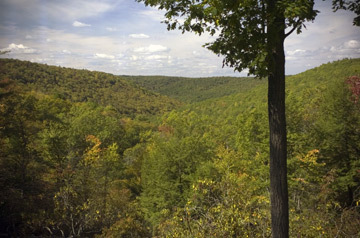 They’re located just outside Cooksville, PA, near Cook Forest State Park. They’re open all year, and reservations can be made with a phone call. They are now associated with Gateway Lodge Bed and Breakfast, and reservations are made through Gateway Lodge. Although I cannot personally vouch for Gateway Lodge, Their setting is also gorgeous, clean, and a fantastic setting. As much as I love scuba, I am looking forward to a weekend of “enforced sloth,” with maybe a walk or two included. This is gonna be great! 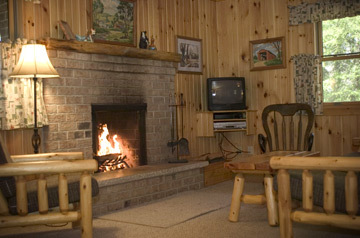 Check out Black Bear Cabins at: http://blackbearcabins.com/ (disclaimer: I borrowed the above photos from their website). Check ’em out. I highly recommend this spot! You know, as I read this over, it sounds like a paid endorsement. I wish! I am raving about Black Bear because I love it that much. And we will be there soon. Just not soon enough! What a difference a couple days makes! Actually I should probably have said, “What a difference a couple months makes!” My mother passed away in October (I hate euphemisms, but there it is), Beth and I went on a long-planned vacation in November, we had the typical Thanksgiving madness after that, and Christmas prep in December. Absolutely no time to reflect, grieve for my mother, or to decompress. Days off over Christmas meant travel, and then the start of the new year. Since then, I have been stressing over this Dominican Republic trip, with the stress and difficulties mounting as the trip got nearer. I remember in high school an incident, in which I committed a serious breach of protocol (that’s “slid-slip” for “I broke the rules”). The teacher against whom I committed the infraction came to school the next day, and visited each home room with his three-foot oak paddle. In those days, paddling was seen as completely justified, and getting paddled was nearly a rite of passage into manhood. In any event, Mr. McCarthy walked into my home room and slammed the paddle down on a desk. It sounded like a rifle shot in a very small room, and I nearly had a heart attack. He made the pronouncement that he was going to find out who had done it, and they were going to get paddled by the end of the day. I probably should have spoken up and gotten it out of the way, but such was not in my thought processes at the time. What a long day that was! I can’t remember any other time that I thought I was going to throw up for hours, that wasn’t illness related. Needless to say, he caught up to me by the end of the day, and I indeed got paddled. I’m not going to say that the anticipation was worse than the punishment, that was the hardest I have ever been hit in my life. (Sidenote: I totally deserved it, and Mr. McCarthy shortly after that became one of my favorite teachers ever.) But what I will say is that the anticipation was absolutely wretched. So it has been for the D.R. trip. I have felt ill, I have been cranky, problems have piled up and nearly overwhelmed me (Control issue? Probably partly). Scuba diving is a life’s pursuit for me, and I haven’t been under the water since November. I haven’t even wanted to dive, and haven’t even felt like talking about it, thinking about it, or assisting in training new divers at the store. The D.R. trip has pretty much consumed me. We leave tomorrow. The time is nearly here. And last night I had the best night’s sleep I have had in a very long time. I think I’ve come to terms with it, and I am almost (emphasis on the word “almost”) looking forward to it! Beth and I get to spend time with friends that we love very much (plus!). Beth and I will be doing this together (major plus!). And I will, at last, be actually doing this for God (biggest plus of all). Still not going to say, “Bring it on,” but I am ready. And the anticipation? It’s here, and it has shifted from a negative anticipation to the positive. Pretty cool! Maybe there’s something to this obedience stuff. Huh! The adventure continues.